⚠️ DEV.to video player is in beta doesn't play for people resulting in an error code but do not worry because we also upload our videos to youtube so here is the youtube link to this video.. If you do happen to go to our YouTube consider giving us a subscribe because it helps us to produce more free video content. 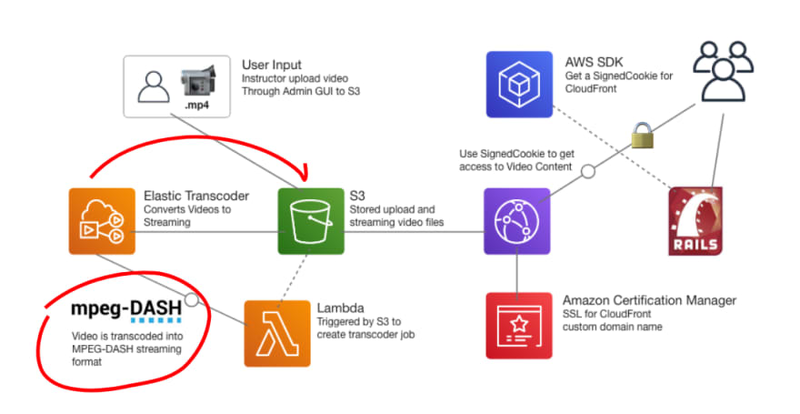 So at ExamPro, we have lots of video content and instead of using an existing provider to serve On-Demand Video Streaming we rolled our own on AWS. This allows us to have full control over the data and also allows us to have a video pipeline for pennies than using a third party provider. We create AWS training and certification study material served in our very own LMS. We spent at least 1 week with AWS Support on ClouldFront to get this working. It was quite the challenge. Getting Signed Cookies with correct the headers and the CORS all working was configuration hell, but we got through it. How to make your own Youtube and get broke in the process, those services are very expensive and the bandwidth cost it's insane:(. If the workload is low (because not everyone is youtube) it's cheaper to use a cheap CDN for the streaming and if the transcoding it's only mp4 to DASH without multiple bitrates and resolutions thats not CPU intensive and can be done with very cheap servers. Its how to build your own "Netflix" and I was deliberate in my wording to not use Youtube because the strategy to keep costs low for publically available videos of larger quantity is different in that I would recommend provisioning your own transcoding servers to lower costs than using AWS managed transcoding services. Sorry buddy, don't mean to tear you down but you're not giving us the benifit of the doubt here. Wow, its seems that I hurt your feelings in some way I was not trying to offend.. sorry I guess.. I´m putting here this because there are many horrors story about people seeing this courses and think that they can build their own (Insert any famous VOD service) and usually they dont explain the complexity of AWS billing and management. Thats why some VOD services looks expensive quoting you "The cost of a developer can outweight a managed service", with a VOD managed service you know you have X storage and X bandwidth, but you dont require to worry about transcoding and streaming protocols that means managed, AWS its far from managed, you need an expert in AWS to manage your infrastructure and they are far from cheap. 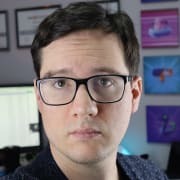 Also transcoding for pennies it's hard to believe only if you are transcoding a small video to a another format but for VOD you have a HD video that you need to transcode from 1080p to 720p,480p, 360p,240p, 144p thats 0.15 USD per minute, and we are not even yet talking about bitrates to make sense to use DASH or HLS, a simple pseudo streaming would work better if not multi bitrates are required (not good for mobile users). Also for the CDN I mean a cheap CDN, cloud front it's far from the cheapest CDN, you can find good CDN like BunnyCDN which is 10x cheaper and has a built in video delivery. I got the point of that you are explaining I just want to leave my opinion so If someone is really interested to make a VOD service they can look other options and when they glue everything together maybe a managed service it's not that expensive. You did hurt my feelings. I just want to share my AWS knowledge. Thanks for this video Andrew. I have one question about this setup. It sounds like you have 1 s3 bucket for all videos and customers either have access or they don't. What happens in a scenario where you had multiple videos courses and customers could purchase individual courses. Would this setup work for that scenario as well and if so any documentation anywhere that could help me with that? Thanks again for the awesome explanation! The use-case you're describing is what we didn't cover in the talk due to time constraist. It was something we did have to solve. CloudFront has a feature called Lambda@Edge which allows all incoming requests to pass through a Lambda function. So when a user requests to view content via our Rails app we generate out our own access token that uniquely identifies that user. We then pass than token along with the request to CloudFront, we ensure that we whitelist that header in the behaviours. We than use that token to validate that user against our database with that custom lambda function. A single bucket solutions works great because its all our own content for a single platform. If lets say we had whitelabeled our LMS so multiple clients used it we could still use one bucket and lock down subdirectories to specific clients. Hey Patrice, what OS and Browser are you using? We are AWS Obsessed and create both free and paid learning material. We have study material for all 10 AWS Certifications on our custom LMS platform with flashcards, white paper summaries, journey paths and exam simulator.